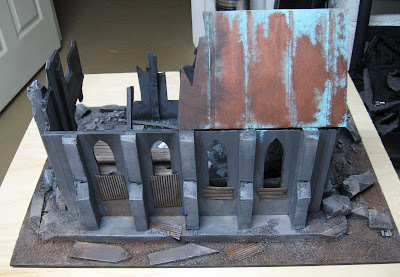 I got a request from a reader this week for the copper roof tutorial I did a while back. I managed to dig up the photos and I've rewritten the text to go along with it. 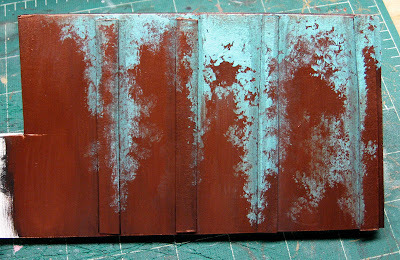 It's real easy to do and like all weathering techniques, "less is more." There are only three colors needed for this technique. 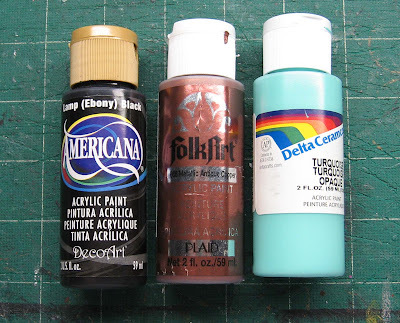 Black, a suitable copper and a bright light-blue/green color. With the GW washes (this was done before them), you might be able to include those to add additional depth and enhance the effect. I made up a quick section of roof out of foamcore and primed it black. Then I painted my base color of copper. Ultimately, we're trying to make the copper (roof in this case) look weathered like it's been exposed to the elements for a long time. You can apply the same technique for things like statues and armour on models. 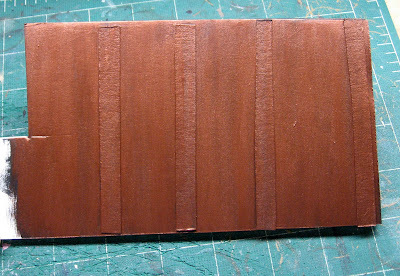 When applying the patina (that's what the effect is called I believe) you want to add the blue in the recesses and areas where water might collect. If you were to do armour, it would be in the places that don't get much wear and handling. I used an old brush to stipple some on along the ridges on my roof. Make sure to vary your brush movements so you don't end up with patterns in your paint. With the blue in place, I went back over it with a black wash in some places to tone it down some and add additional weathering to it. Remember. 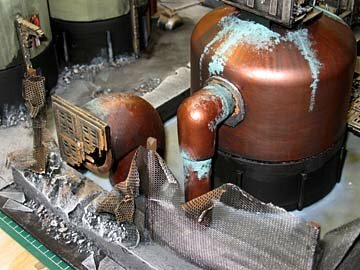 it's not just this effect that will make your copper "weathered" but a combination of techniques that will get the best looking results. Another trick is to take your metal color and drybrush it back over the blue making any raised edges look like they are "cleaner" and there is no buildup on those parts yet. true that, a nice looking effect. Gurra: Funny you should ask that very question... the palace will be making a comeback in the coming weeks hopefully. I want to get it finished for Planetstrike. I think it will fit perfectly with the supplement... or at least look cool. Very timely, I'm looking at doing that effect on some Warmachine models. Hudson: Believe it or not, someone asked me about this because he wanted to show one of his friends for their Warmachine models. Interesting stuff - I use the same colors, but reverse the order. 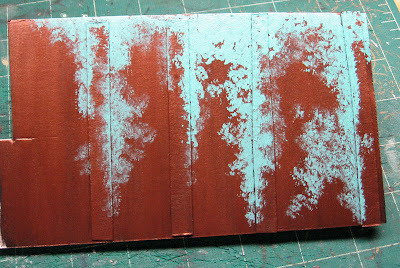 I start by painting the blue-green into the recesses, and then stipple/drybrush the copper color over it, leaving the deeper areas that are 'protected by the elements' with the verdigris look. I'll have to try your method on the next CoD building I'm working on and see how it turns out. Thanks for the tutorial! Ron, Good timing on this as i am looking for different painting techniques for painting up some buildings. Thanks this will help out a lot. Mordian7th, that is a good idea too, i will have to try that one out too. After all i do have a few buildings to do.